For my twenty-first birthday Andy bought us two matching bikes. We've never been serious bikers but we've always enjoyed cruising around, and checking things out. We still have our bikes but it's been a long time since we've taken them out on the road, they've been in storage with flat tires for several years now. Richmond has a strong bicycle subculture, and the city is great for exploring with wide roads and little traffic. Fitness and outdoor enthusiasm feel contagious here. People are on the move wherever you look and while I've wanted to get the bikes tuned up for years, a few weeks ago it dawned on me that I could use our bikes as transportation in this city. Yes! All those little trips that we make every week to pick up a few things at the grocery store, to drop off a letter at the post office, the quick jaunts to the park--we can get almost anywhere on a bike. And feeling the sunshine on our faces sure beats the car alternative with Spring weather like this. First things first, the bikes needed rehab. I wanted someone to come to me and so I found Joe's Mobile Bicycle Repair. I called one weekday morning and Joe showed up (on his bike, of course) in the afternoon towing a trailer with all of his tools. We chatted, he did his thing with our bikes, the kids got busy with all the moving bike parts and gear grease, and in less than an hour our twin bikes were good as new. As for how to transport the kids, we had looked into some cool bike seats but after considering safety, cost, comfort, and the longevity of each option we decided to invest in a bike trailer. We found a great deal on craigslist for a gently used Burley Encore. The kids are protected from the weather, and it has storage in the back for diapers/toys/food and any items we might happen to pick up along the way. Their helmets are from Trek and Bontrager. We've been biking every day and we are loving the wind in our hair and freedom from our car. 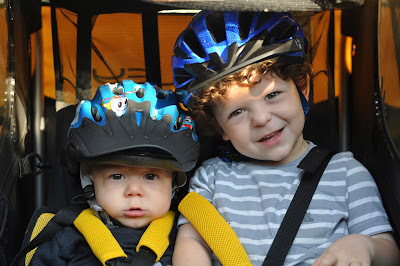 The kids are surprisingly quiet and content when we ride, which is a huge relief. I thought for sure that the combination of snug quarters and helmets would bring out the worst in them, but they seem to love it. I'm still not entirely confident riding on the road with traffic, although we do. We need a few more essentials to ensure safety on the road, like safety lights, more reflective tape, a kickstand for me and a mirror (do they even make these!?) so that I can check out traffic to the rear as I navigate around. We went on a family rain ride this morning. The water was pouring down, the kids were drinking smoothies under cover in the trailer, and we were scouting for dream homes in our favorite neighborhoods. When we thought we couldn't possibly get any wetter we stopped for a snack at a coffee house on the way home and when we came out it was raining even harder. It was a very happy start to the weekend. IN wish that our roads were as safe sounding as yours...or even just slightly wider because that is something that I have wanted to do since Brayden was born.